Preheat oven to 425 degrees Fahrenheit. Set up 12 muffin liners. 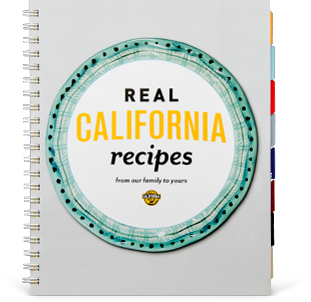 In a medium bowl whisk together Real California milk and Real California yogurt. Set aside. In a large mixing bowl combine flours, baking soda, sea salt and optional spices. Stir in olive oil and brown rice syrup. Pour in your Real California milk, Real California yogurt mixture and Real California Jalapeño Cheddar cheese. Mix with a wooden spoon until just well combined. Be careful not to over mix. The dough should be thick, lumpy and moist. It should not be smooth or liquid. 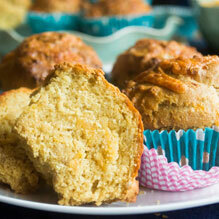 Distribute the batter evenly into muffin liners. Top with extra Real California Jalapeño Cheddar cheese if desired and baking in the oven for 5 minutes. Lower the heat to 375 degrees and bake for another 12 minutes. The tops will be golden brown. This high temperature to low temperature is a tip I learned from Sally's Baking Addiction blog on how to create sky high muffin tops. Once done baking, let cool for 5 minutes and serve immediately. These stay fresh in an airtight container at room temperature for 3 days. Refrigerate for up to a week. To reheat, place in the oven on broil for 2-5 minutes. Enjoy!